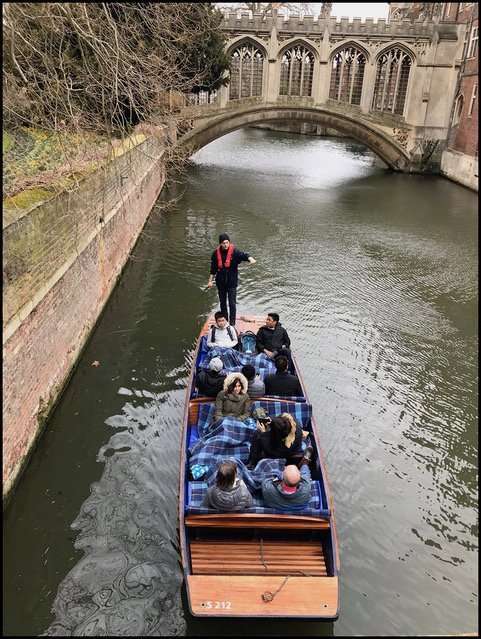 This post is the third in a series describing a week-long trip I organized to take a group to London and Cambridge. 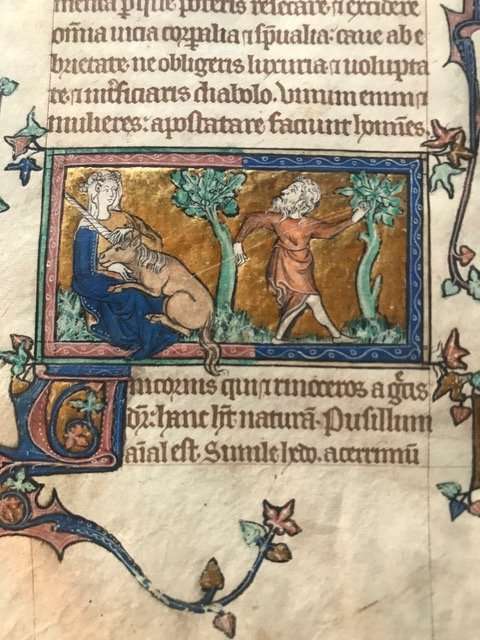 The first post talked about the manuscripts we saw in London and the second post is about the exhibits and manuscripts we saw at Parker Library in Cambridge. 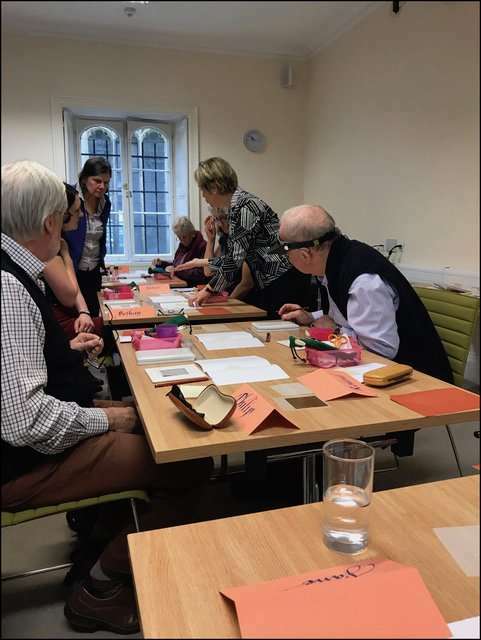 This post will detail a workshop we took with Patricia Lovett. For those of you unfamiliar with Patricia and her work, please be sure to check her website. 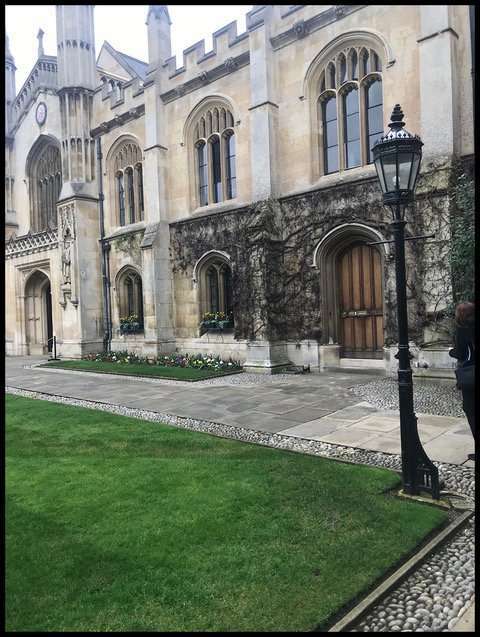 The experience of being in Cambridge only enhanced what promised to be a very enjoyable workshop. 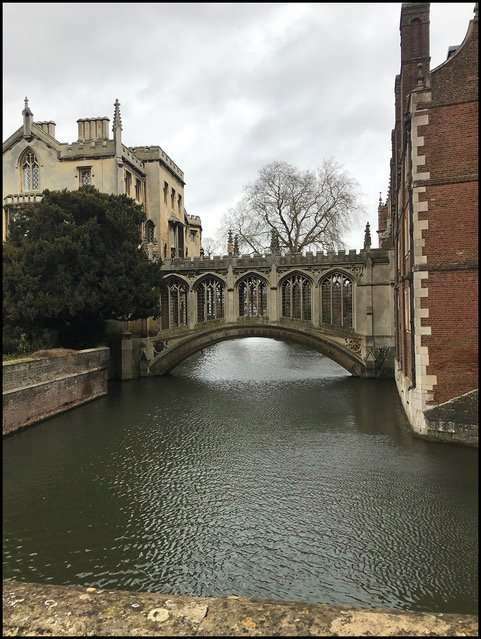 The architecture around Cambridge is fascinating and beautiful. 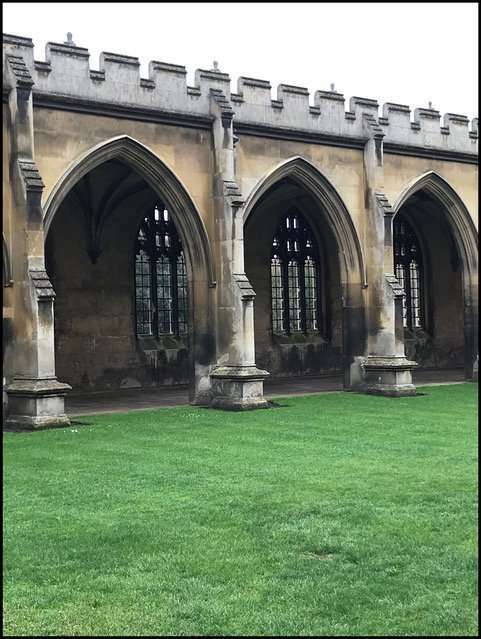 Although it was snowing when we got back home, we were pleasantly surprised to find green grass and blossoming window boxes around Corpus Christi College, where our workshop would take place (photo 30). At every turn, there was another beautiful building, rich in history and culture (photos 31 – 34). 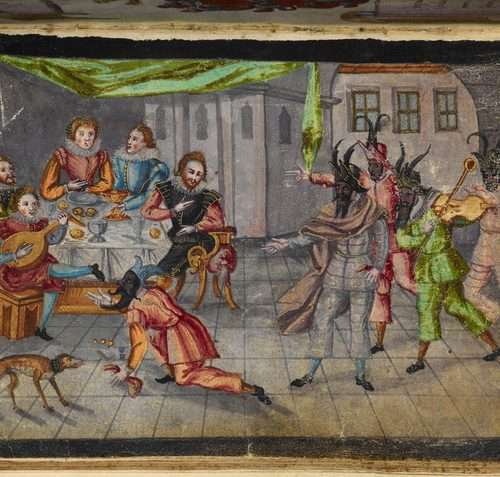 The workshop’s focus was on bestiary painting. Some of you may know I have offered bestiary painting workshops in my studio/shop in Marblehead (and will continue to do so, so keep an eye out for upcoming schedules if you are interested) but I was excited to be a participant this time for a change! We were part of a group of about 15 scribes under Patricia’s tutelage. 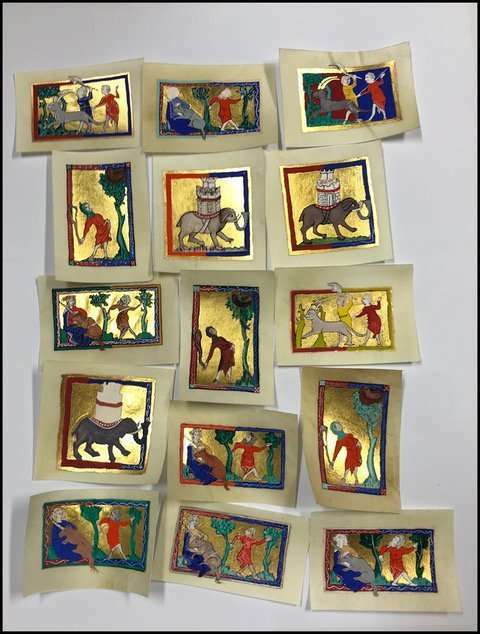 We had a fun and exciting day recreating animals from the Peterborough Bestiary and painting them with gouache and applying gold leaf – all on calfskin vellum. The day before the workshop, my group had the pleasure of seeing the bestiary up close (see previous blog). We had all selected an animal to recreate before beginning the workshop, and mine was the unicorn (photo 22). 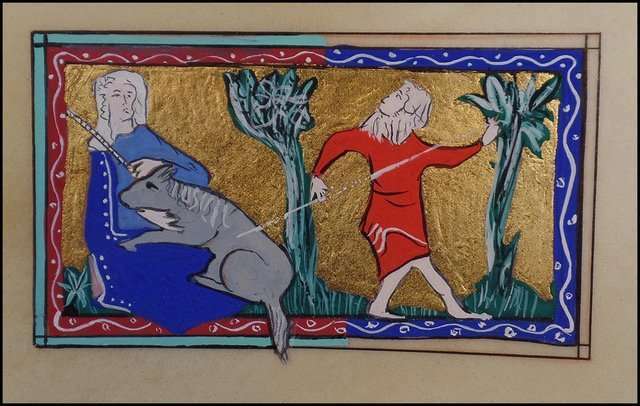 Patricia (shown standing on right in photo 35) began by instructing us on tracing our animal image from a reproduction from the bestiary. Take a close look at the rectangular white porcelain boxes on the tables among the other supplies – I’ll come back to those later. 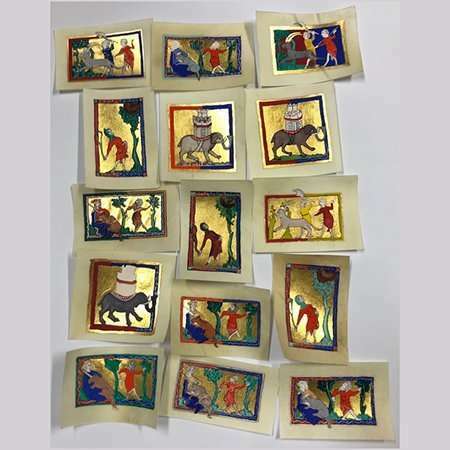 She reminded us that the images we were using, although quite small (approximately 3.5” w x 2” h – roughly the size of a business card), were larger than the images in the actual bestiary. 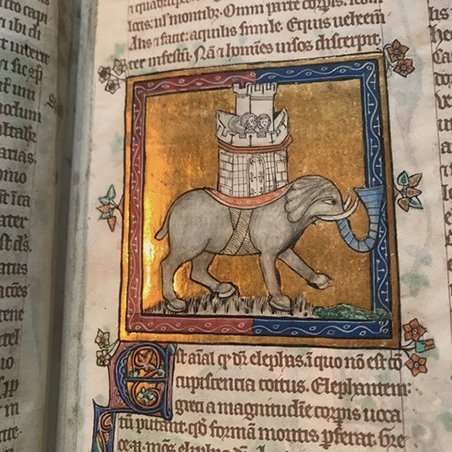 She also reminded us that when the bestiary was new the colors were much more vibrant than the colors we see today, and that we should keep that in mind as we made our paint selections. 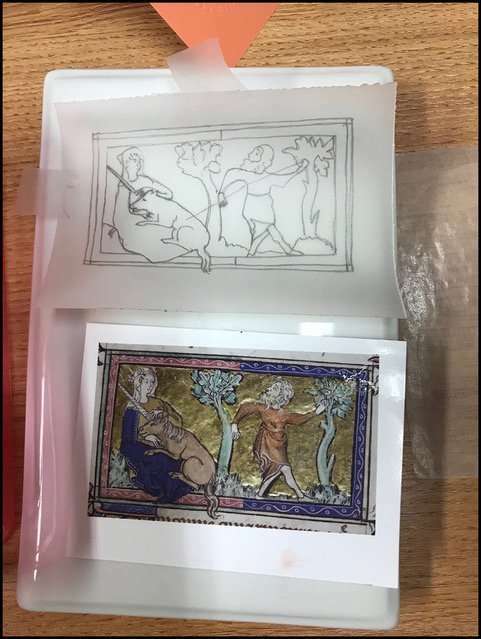 We traced over the images by laying tracing paper over the image, taping the image and tracing paper in place, and drawing the image with a very sharp, hard (3H or 4H) pencil (photo 36). 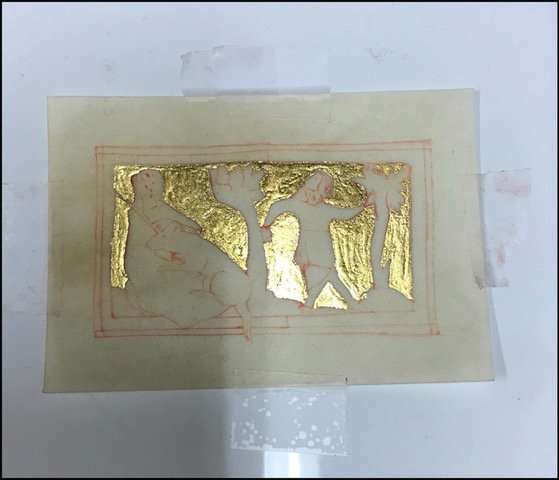 We then transferred the design to our vellum pieces using a special transfer paper Patricia had prepared with Armenian bole (a red clay-like substance ground into a very fine powder), which acted something like carbon paper (remember carbon paper?). We then had a faint, red image of our animal on the vellum. This outline allowed us to recreate the image without drawing it freehand. 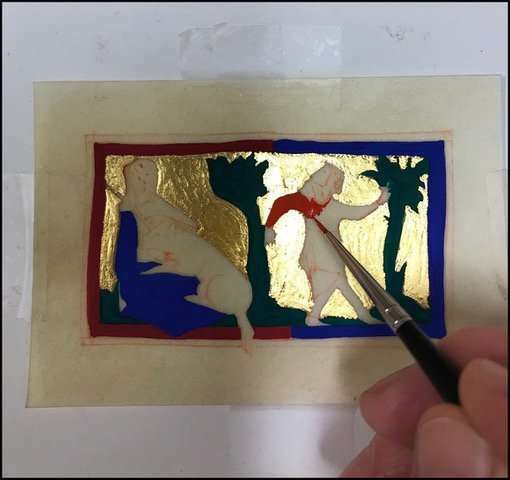 The first step was to lay the gold leaf (always done before any color is added) by using an adhesive called Miniatum. 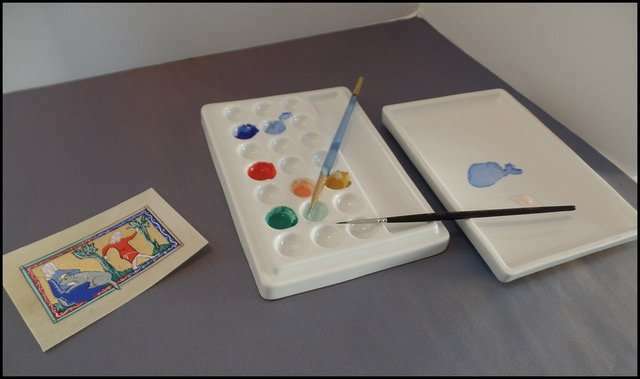 Ordinarily gesso would be used instead of Miniatum, but because gesso requires a much longer drying time and this was a one-day workshop, Miniatum was the best solution (photo 37). Using a very tiny brush, we painted the first layer of color (photo 38). By working from darker colors to lighter colors, we added in shading and detail. 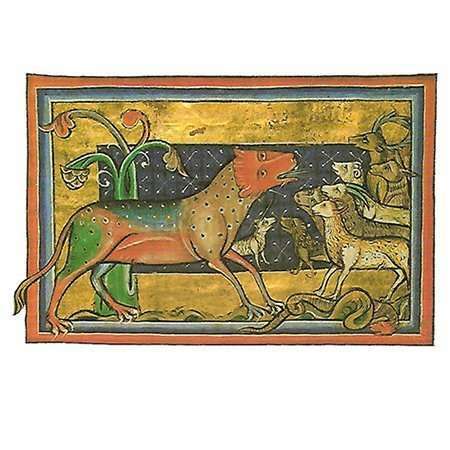 Take a look at the group’s bestiaries! (Photo 39.) Several of us didn’t quite get finished our bestiaries by the end of the day, and so they had to be completed once we returned home. My completed unicorn is shown in photo 40. In truth, not what I would consider my best work, but that isn’t surprising as the product of a workshop. Any of you who have taken workshops with me will (hopefully!) remember that I try to stress learning the technique over trying to create a masterpiece! Patricia is an excellent teacher and a pleasure to be around. She is not only a gifted calligrapher and artist, but she’s very personable and has a great sense of humor. Among the many “take- aways” from the workshop is a fantastic paint palette we used (the little white boxes I referred to early in the post) in photo 41. I loved these! They have 21 wells to hold as many colors, a large area for mixing colors, and a top that keeps the paints wet for days. And because they are porcelain, they clean up easily, even once the paint dries. They’re fantastic. In fact, I liked them so well that I now carry them in my shop! These trips are always so much fun! Some trips are big ones (like this one) and some trips are smaller and domestic (occasionally even local in Boston, or not too far, like New York City). If you would like to receive future information about the trips, please email trips@theabbeystudio.com and request that your email address be added to our email list. Next Lions and Tigers and Bears! 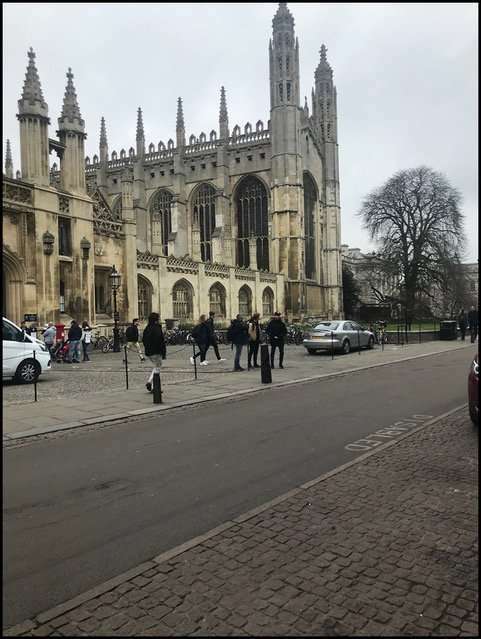 A Visit to Cambridge, U.K.